No further comment is surely needed … although maybe the German is better. All this is even more regrettable because, as I observed a couple of years ago, the music of Sviridov deserves to be properly presented to audiences. Indeed the Pathetic Oratorio seems to boast of at least two other recordings apart from this one. A 1961 Melodiya LP, one of the very first stereo issues from the Soviet Union, features the same bass soloist; a later 1991 version on Koch Classics (3-7017-2 H1) came yet again without text or translation, although David Fanning in his Gramophone review pointed out that both were available in the published vocal score. Fanning in another review a couple of years later dismissed the oratorio as “lowest-common-denominator, poster-art music” and returned to the attack in 1999 describing it as “abjectly conformist.” The early 1961 recording was reissued on a Melodiya CD in 1991, again without texts or translations. I cannot however trace that this 1979 recording was ever widely issued at the time, although Rob Barnett in 2003 did review an earlier CD transfer on the same label - which furthermore did supply an English translation of the text. It appears to adopt a slightly different version of the score from that employed on Koch, adding a mezzo-soprano soloist in addition to the bass (as did the 1961 Melodiya LP) but the chorus is now uncredited although the earlier release named the “Grand Choir of USSR Radio and Television” and described it as a “live recording” – no longer stated on this reissue; there is no evidence of an audience. I cannot begin to imagine why the choir has been stripped of credit, since Rob Barnett was impressed by their “blazing undistorted tone.” Be that as it may, since neither of its two competitors seem to be readily available any longer, it has the field to itself. The music itself, despite David Fanning’s disdain, is really rather good if unsubtle in its embrace of Soviet realism. The oratorio opens with a forceful declamation by the bass soloist taken up enthusiastically by the male chorus with brassy orchestration, rather in the manner of Prokofiev’s music for Ivan the terrible. It makes a dramatic impression which would have been even more effective if the listener had the foggiest idea what the words were about. Vedernikov shows some distressing signs of strain on his high notes, and his voice is not ideally steady, but he is thoroughly involved. At the beginning of track 2, with the entry of the female voices and the spoken declamation from Vedernikov, the parallels in sound to Ivan the terrible are very close indeed. We are told that the music describes “General Wrangel’s flight” but are given no clue whatsoever as to who this general was. Wikipedia informs us that he was a White Russian leader who died in Brussels in 1928 supposedly as the result of poisoning by Soviet agents, but Sviridov’s attitude towards him remains obscure although he was apparently the subject of a popular Soviet song in the 1920s. The next movement is dedicated “To the heroes of the battle of Perekop” (which shares the subject with Shebalin's Fourth Symphony (1935), Ed.). Whether this refers to the 1920 engagement during the early days of Soviet Russia or during the German invasion in 1941 is not explained. The movement “Our land” begins more lyrically, with a beautifully poised flute melody; but again one notes strain on Vedernikov’s high notes. On track 5 Raisa Kotova takes over solo duties in a folksy song, but in the following “Conversation with Comrade Lenin” the vocal line now seems to lie uncomfortably low in places for Vedernikov. He may have found the role more congenial in 1961, but his voice eighteen years later sounds undesirably worn. The imitations of chiming bells in the finale are positively Rimsky-Korsakov-like in tone, recalling in places the Invisible City of Kitezh. For all that, the Pathetic Oratorio is an enjoyable listen, providing that you don’t expect too much. Rob Barnett is his review referred to a sound drop-out on the left-hand channel in track 4; this appears to have been rectified here. The other works on this disc, recorded fifteen years later, are much less obviously written with political considerations in mind, although once again would have welcomed more information as to what the music was actually about other than track titles such as “Tastooshka” (whatever that might refer to). The opening movement of Time forward has an open-air feel to it, perversely rather like a Russian version of Aaron Copland at the beginning of Billy the Kid; but the melody itself is glorious. It is described as “The Ural’s melody” [sic] but whether it is a traditional tune or not I cannot say. Elsewhere the influence of Sviridov’s teacher Shostakovich is apparent in the sardonic March although the following “Little Fox-Trott” [sic, again] has the airy feel of Khachaturian in his lighter moods. The final movement was apparently used at one time as the theme music for the Russian evening news bulletin and became very popular. 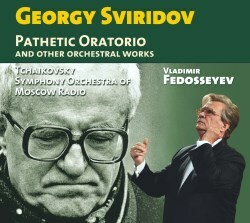 The Small Triptych begins with a delicate movement opening on the strings which has some of the hallmarks of neo-classicism in its restrained atmosphere, although the writing for tuned percussion suggests that Sviridov had absorbed Shostakovich’s Fourth Symphony - which had finally received its belated première in 1961. The second movement is pompous and bombastic, with stentorian brass and plentiful gong strokes, while the finale begins with balalaika-like thrumming on the strings and has a folk-like feel. Again one is aware that there seems to be some programmatic intent behind the music, but one would like to know what it is. The Spring Cantata is a choral work of a very different stamp from the Pathetic Oratorio, sounding like a collection of folksong arrangements with very minimal orchestral accompaniment; the opening Spring is coming has a positively Orff-like jog-trot rhythm. The tuned percussion beginning of the purely orchestral third movement Bells and horns is rather fetching if over-extended, like an early minimalist score; the finale is a full-scale choral peroration entitled (wouldn’t you just guess it?) Venerable Mother-Russia [sic] with some very tinny-sounding bells. The Urlov singers, familiar from many other Russian recordings of the period, are superlative throughout. At the end of the disc the brief Echo of a waltz from Snowstorm makes a rather forlorn appendage at just over two minutes, but is fine if treated as an encore. The performances and recorded sound are generally excellent. Sviridov apparently made a point of attending all recording sessions for his music, sometimes to the participants’ discomfort and the only thing precluding an enthusiastic welcome for this disc is the quite abysmal nature of the presentation. Those who love the music of Sviridov, or who just would like an enjoyable listen without worrying about such rather essential matters as words or meaning, will be well satisfied.